To navigate easier through many lines of code in SQL Server Management Studio (SSMS) Query Editor Window, it can be useful to bookmark some lines to which you would like to return to. 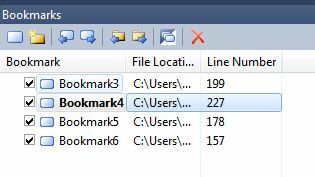 To move to the next bookmarked line of code from the current cursor location press 'CTRL+K' followed by CTRL+N, to move to the previous bookmarked line of code press 'CTRL+K' followed by 'CTRL+P'. To clear all bookmarks press 'CTRL+K' followed by 'CTRL+L'. You can move the cursor to the bookmarked line by double clicking on the bookmark in the Bookmark Window. There is an option to rename bookmarks in the Bookmark Window. Copyright © 2012 - 2019 SQL Server Administration Blog | zarez.net - All Rights Reserved - Disclaimer: All information, and code samples, is provided "AS IS" without warranty of any kind. Please verify all the information and code samples before using them. zarez.net shall not be liable for any direct, indirect or consequential damages or costs of any type arising out of using the sample code or any other information from this site.